JAMIE Laurence Clark is only five weeks old but already he’s the subject of a BBC One documentary and an Edinburgh Fringe show. The son of comedian Laurence Clark and his wife Adele, Jamie is at the heart of a film broadcasting in the autumn, on his father’s comedy career and the Clarks’ experiences as parents with cerebral palsy. 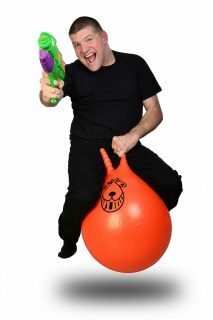 Cameras have followed the family for six months and will continue to do so at the Fringe, as the comic bemoans the festival’s “lack of crèche facilities” and negotiates its cobbled streets in his wheelchair, all the while performing his show Laurence Clark: Health Hazard! in the evenings. Like his brother Tom, Jamie was born within the National Health Service. And he’s provided plenty of humorous material for Clark’s staunch defence of free, universal healthcare, after the comic spent time in America investigating the US system and uncovering alarming precedents for the UK. Perversely grateful to Philip Davies MP, who has suggested paying disabled people less than the minimum wage to increase their chance of getting a job – “what you see is what you get, he shows up the ignorance in the Conservative Party for what it is” – Clark is nevertheless furious at the recently announced privatisation-via-competition and the smokescreen he perceives in the Prime Minister’s rhetoric. More sobering though, his cerebral palsy is the result of his mother being neglected during childbirth while hospital staff celebrated New Year’s Eve. Left too long without assistance, a breech birth left Clark’s brain starved of oxygen. “I think I’m an interesting person to speak for the NHS given my experiences haven’t always been positive,” he reflects. Besides, after several critically acclaimed Fringe shows specifically about disability, he felt that he’d “said everything I wanted to say about the subject”. Over the course of ten days in America recording interviews and hidden-camera stunts, Clark heard plenty of myths about the NHS, not least on the perils of “socialism”. Clark is uncomfortable with being labelled a “political comedian” (“the show is political but I’m showing how it works in real life rather than telling people what to think,” he says) and he’s equally wary of being perceived as worthy, or simply reinforcing the views of sympathetic, liberal audiences. He is anxious to avoid accusations of lazy Yank-bashing too, exhaustively researching the US health insurance system, performing difficult gigs in places like Philadelphia after four hours of gospel music, and taking pains to listen closely to his subjects, even if some were reluctant to talk. In the past, he’s has had no enthusiasm for single-focus documentaries “on one or two disabled people, they’re not really my sort of thing”, and admits to a certain hypocrisy with his forthcoming film. Still, he justifiably feels aggrieved that his many four and five-star Edinburgh reviews haven’t translated into a broadcast vehicle beyond an appearance on Channel 4’s Embarrassing Bodies and a 2003 guest report on Newsnight, in which he highlighted discrimination against disabled people in abortion law.